Winter is here in all its glory, but that’s hardly a reason to remain couchbound. 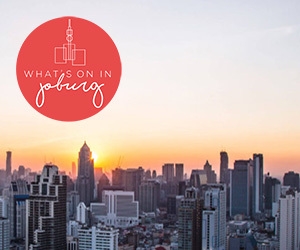 For those wondering what to diarise this July, we’ve put together a guide to 10 of the best events happening in Cape Town this month. Cape Town’s largest electronics and gaming expo is back for its fifth. The event offers LAN gaming, Cosplay, tabletop games, gaming competitions and a host of different stands selling popular culture merchandise and memorabilia. A stage production of Joan Didion’s acclaimed novel, starring Dorothy Ann Gould and directed by Mark Graham Wilson. The narrative structure of the book follows Didion’s re-living and re-analysis of her husband’s death throughout the year, in addition to caring for their daughter Quintana. The Cape Town City Ballet presents a popular classical ballet portraying the tragic tale of a young girl who loses her mind when jilted by her fickle lover. The Cape Town Philharmonic Orchestra accompanies all but one performance. Cast includes one of Europe’s top ballerinas, Ksenia Ovsyanick (Berlin State Ballet), Laura Bosenberg, Daniel Szybkowski Kirstel Paterson, Conrad Nusser, Mariette Opperman and Xola Putye. The Baxter Theatre hosts the 14th annual festival, featuring the best South African comedians and famous international variety acts on the same stage. The 2018 line-up features Alan Committie, Marc Lottering, Gerry Connolly (Australia), Raymond Raymondson (France), Tats Nkonzo, Rob van Vuuren, Mooky Cornish (Canada), Siv Ngesi, Garaghty and Thom (UK), and Khanyisa Bunu. Disney on Ice presents Dream Big, a new show that sees Tinker Bell take audiences on an enchanting pixie-dust filled journey of beloved Disney tales. The show follows eight Disney Princesses – Ariel, Belle, Cinderella, Rapunzel, Tiana, Jasmine, Aurora and Snow White – who embark on incredible adventures, determined to make their dreams come true. Locals and visitors celebrate the valley’s centuries-old French Huguenot heritage. The Food and Wine Marquee is set against the backdrop of the historic Huguenot Monument, where guests sample the valley’s wines on offer or have a taste of the gourmet fare available to purchase from some of Franschhoek’s well-known eateries. Cape Town Opera presents the award-winning and critically acclaimed Mandela Trilogy, a musical tribute to the life of Nelson Mandela. The production takes audiences into his unknown early life, then through the heady and rebellious jazz-fueled days in Sophiatown, and finally, the low times he had in prison on Robben Island. Kidz Season offers Capetonians the chance to explore the mountain, with two children riding for free with an adult who has purchased a return ticket. Children enjoy a day of fun, food and natural beauty atop Table Mountain, as well as a kiddies’ treasure hunt. As part of the Kidz Season experience, all children receive a treasure hunt map and something sweet when they hand in their voucher at both the Shop at the Top and the Cafe. The Norval Foundation concert programme presents a performance by Swiss jazz group, Hildegard Lernt Fliegen. The group, which describes itself as being “on a quest for musical ingenuity” – walks a continuous tightrope between jazzy exuberance and quirky humour. An opportunity to enjoy scenic views of mountain and ocean, on a route that starts and finishes on the Sea Point Promenade. The festival offers four distance options over two days, including the longest road race distance in Cape Town. The weekend is made up of the 100km Ultra and 50km Mini Ultra plus a 5 x 5km Relay on Saturday and a 21km half marathon on Sunday. Both Ultras include a free T-shirt. For regular updates on the best events in Cape Town subscribe to our weekly newsletter.